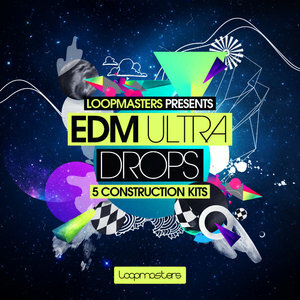 Loopmasters proudly present EDM Ultra Drops and exclusive EDM collection that includes 5 sample construction kits featuring elements and stems for Drums, Synths, Bass and SFX all carefully labelled with key and tempo ready for producers to simply arrange and build powerful Mainroom productions. EDM Ultra Drops weighs in at just over 1 GB and comes with 5 powerful Bigroom EDM song starter kits containing loop stems, one shot samples and MIDI files. Inside each kit folder you will find all the tools you need to build thunderous room shaking club tracks with separated loop stems for Kicks, Snares, Cymbals, Percussion, Lead Synths, Chords, Fills, Vocals, Bass and SFX plus each kit comes with selected one shots and MIDI files of the Melodic content allowing you to fully customize the sound and melody. Don’t forget to say Thanks !! !